Saving money is a worthless endeavor if you don’t really “save” it. 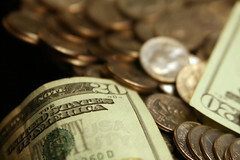 Too many times, I have personally started doing frugal activities and later noticed that somehow the savings vanished. I never really saved any significant amount of money because the money just got absorbed by something else. I’ve had to “start saving my savings” to really make a difference. Snowflake your savings to pay off debt. Save for your retirement or for a specific goal or passion. If you’re interested in tricking yourself into saving money, here are 17 specific strategies (actually they’re tactics but I love alliteration), to save money. The big picture is avoid spending your savings on frivolous stuff that you really don’t need! Every time you get a book from the library, deposit half the cost of the book in a high yield savings account. 2. Send yourself a bill for savings. People give high priority to printed bills so think of your savings as a bill that simply MUST be paid. You have no choice in the matter. Period. When you leave the house every day, carry only five dollar bills and put all your ones into a savings “jar” when you get home. Every Friday, deposit the entire amount into a savings account … and don’t count it until you’re already at the bank. Then transfer it to a high yield account such as those at Ally Bank. Learn to fix your favorite restaurant meals at home and save the cost difference. If a family of 5 eats out once per week, they can easily save $150 per month, plus making your own southwestern egg rolls is a lot of fun! 5. Your own tip jar. If you go out to eat, tip yourself the same amount as you tip your waiter. 6. Make it an even amount. Round up all your purchases to the next $5 or $10 (you pick) and save the difference. 7. Have you just paid off a bill? Save the same amount you were paying (unless you’re applying that money to another bill). Do you shop at a store that requires you to join their “savings” club? Deposit that saved amount (usually at the bottom of your receipt) into your savings account when you get home. 9. Get an ROI on that movie. When you return a movie (hopefully on time), pay yourself the late fee. 10. Charge your own admission. If you rent movies from an online movie service or from Redbox (and who doesn’t these days? ), pay yourself $2 for every movie you watch. 11. Eat healthier AND save money. Forgo dessert when you eat out and save the amount it would have cost. Double the benefit! 12. Gift yourself the gift of less stress. Open a Christmas Club account and save a certain amount each month, even if it’s only $10. You’ll never miss it. 13. Make ‘em pay YOU. Regardless of what they sell, if you’ve switched companies for price reasons, save the difference. Think of phone companies, internet access, cell phones, your credit card, and others. 14. Can a lighter light bill mean a heavier wallet? It can if your utility bill came in a little lighter this month. Save the difference! 15. There’s cash in that lunch box. Brown bag your lunch at least 3 times per week and deposit the savings every Friday. 16. Own your own laundry mat. Drop a quarter into a jar every time you use your own washer or dryer. 17. Make cash rewards really work for you. If you use a cash rewards credit card (and pay it off faithfully every month), deposit the cash rewards. Save the amount you don’t spend. The key is to start saving something today and you can start by saving your savings. It doesn’t have to be a set percentage, a set amount, or large sum. Even if you’re on a tight budget, these small amounts will add up over time. Saving money doesn’t have to be hard (it isn’t hard to make extra money either) but it IS important to involve your whole family. Plan a treat for everyone when you reach your savings goal, such as such as a day at the zoo, the park, or a museum. What other sneaky methods can you think of to save money?